My dad has planted a little garden in front of the store downtown. Here is some of the late season harvest from Friday. 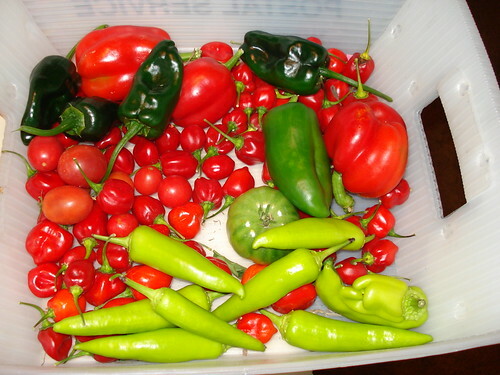 It's some nice variety with Poblano peppers, Chinese Giant, Red Bell Peppers, banana peppers, and an overwhelming amount of habaneros. 1. My go to dish for habaneros is Chili, but I can't make that every weekend. So I need to expand my repertoire of habanero dishes. 2. I'm trying to decide which is the best way to preserve them. I"m going to try air drying them and freeze drying them in liquid nitrogen. We'll see how well that works.